Dy CM Chowna Mein stated that “Teachers are the torch bearers of the Nation. They are the Master Craftsmanship of our young generations”. 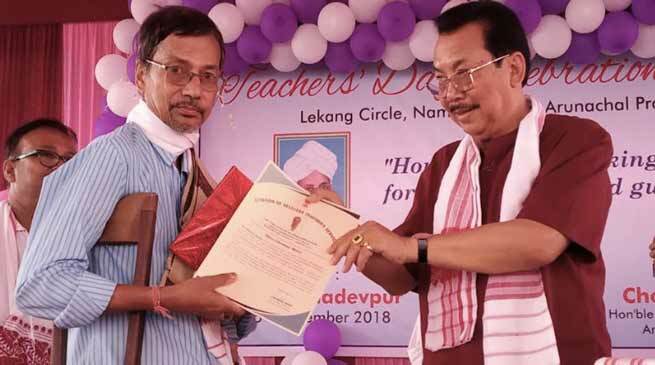 Deputy Chief Minister, Chowna Mein celebrated the Teacher’s Day along with the teachers and students of Lekang Circle at Govt Higher Secondary School, Mahadevpur today. He, further referring to the poor performance of the Govt Schools in the CBSE Examinations in the last two years said that to some extend we may blame the no-detention policy adopted by the previous Govt in the Centre but at the same time we all have to shoulder the responsibility equally. He said that we need to introspect ourselves where we are lacking and bring in corrective measures where ever is required. He exhorted the teachers to be regular and punctual in attending the schools and be a role model for the students. He said that a good teacher can make the life of the students but a bad teacher can also spoil the life of a student. He also underscored the importance of the role of parents in supporting the teachers and the school authority in disciplining the pupils if they are indiscipline and disobedience. He further requested the teachers to put in a little more efforts to improve the performance of the Govt Schools in coming CBSE examinations. He said that the Governor of Arunachal Pradesh is very much concerned about the quality of education in the State and also about the availability of textbooks in the schools on time. While reiterating that Health & Education is the top most priority sector of the State Govt, he said that Govt is doing all efforts to improve the health & educational scenario of the State. He expressed his gratitude to eleven teachers who are retiring on superannuation this year and felicitated them on the occasion. Mein also felicitated 14 best performing teachers of Lekang Circle on the occasion. EAC Mahadevpur, S Roy, Teachers and Students also spoke on the occasion throwing lights on the life of former President Dr Sarvepalli Radhakrishnan. School children also presented songs and a traditional fashion show on the occasion.